All Sikh Gurdwara's have a Nishan Sahib, Darbar Sahib, a Langar Hall and a kitchen. 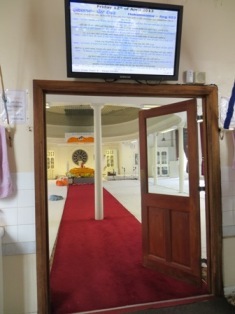 In addition, Gurdwara Shaib Woolwich has two darbar sahib (a lower and an upper), a meeting room/Library, an office, a social area, granthi quarters, car park, a lower hall used for various functions and other miscellaneous rooms. Darbar Sahib refers to the main court within a Sikh Gurdwara. 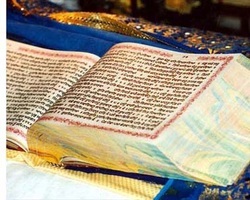 The Guru Granth Sahib Jee is placed in a prominent central position facing the sangat (the congregation). Darbar means court or a hall. Allowing multiple services and programs to be held simultaneously, the upper level darbar serves the same function as the lower darbar sahib. The word Guru is the presiding presence in all Sikhs Gurdwara's. Raised and flown at a prominent postion, the Nishan Sahib makes all Sikh Gurdwara's easily identifiable. The word 'Nishan' means flag, insignia, or a banner. Run selflessly by communal participation and contributions. Open to Sikhs and non-Sikhs alike, the langar hall is a communal refectory serving vegetarian food.